Falafel is very popular in the Middle Eastern fast food. It can be served as a main dish , a sandwich stuffed in pita bread with lettuce, tomatoes, and tahini. It can also be served as an appetizer on a salad, or with hummus and tahini. 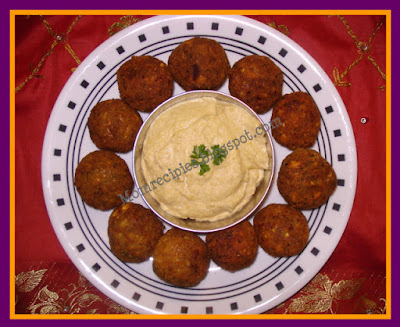 Falafel is high in protein, complex carbohydrates, and fiber.Falafel is hearty enough to replace hamburger patties and meatballs in vegetarian dishes. * 1 cup dried chickpeas or 16 oz. can of chickpeas or garbanzo beans. 1) Wash and soak chickpeas in water overnight. Omit this step if using canned beans. 2) Drain chickpeas next morning and put them in pressure cooker and cook with water for 3-4 whistles.Cool for 15 minutes then remove the lid and drain them.OR Drain chickpeas, and place in pan with fresh water, and bring to a boil.Allow to boil for 5 minutes, then let simmer on low for about an hour.Drain and allow to cool for 15 minutes. 3) Combine boiled chickpeas, garlic, green chilli ,onion, coriander powder, cumin powder, salt and pepper (to taste) in food processor or blender. You want the result to be a thick paste.Don't add water while grinding.Take the grinded mixture in a bowl .Then add flour.Mix well. 4) Form the mixture into small balls, about the size of a ping pong ball. 5) Deep Fry in 2 inches of oil until golden brown .It will take about 5 minutes. 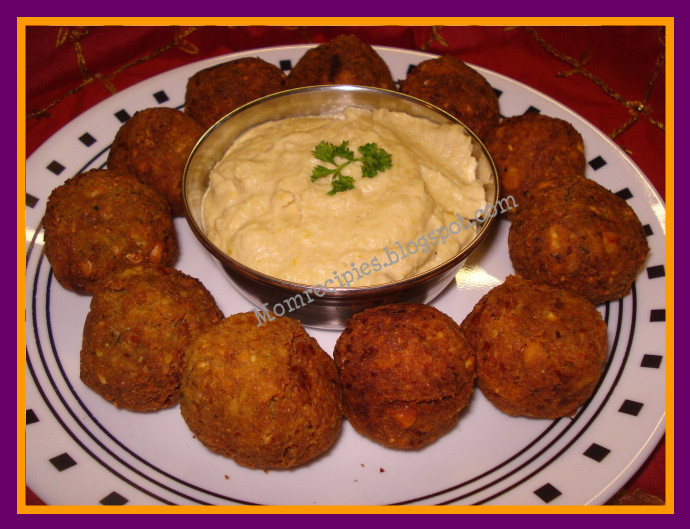 Falafel can be served as an appetizer with hummus and tahini, It can be served as main course , stuff pita bread with falafel, lettuce, tomatoes, tahini . As an alternative, falafel can be formed into patties and served like a burger. I love falafel and this just looks so so good. Wish i could grab few.